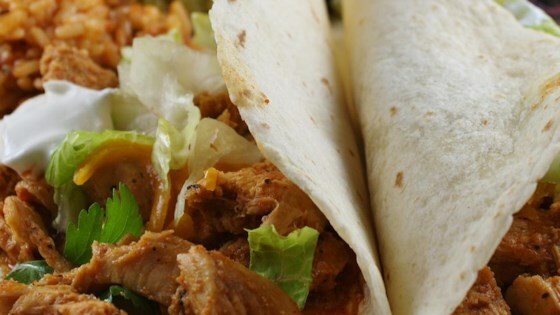 "This recipe is easy, yet delicious when used in tacos or other Mexican cuisine. Try it for enchiladas and nachos too." I did make some changes. I used 2 pkgs of Chicken taco seasoning instead of reg taco & I added a can of Rotel. Served it on tortillas with cheese & sour cream. It was so yummy. Amazingly quick, easy and delicious. Used 5 bone-in chicken breast with the skin removed. Put it on high for about 4 hours. Used in burritos, nachos and enchiladas. Very nice! I halved the broth and added a jar of salsa along with the taco seasoning. This was simple to make and very tasty! The family all loved it and definitely great for a slow cooker kind of a day.